Nykaa Pout Perfect Lip & Cheek Crayon - Brick Me Red 04:Don't let anybody bring down your spirits! Shine like a diamond in Nykaa Pout Perfect Lip & Cheek Crayon in Brick Me Red. This brick red shade is all you need to put your glam face on! Nykaa Pout Perfect Lip & Cheek Crayon - Call Me Red, Darling! 06:Nykaa Pout Perfect Lip & Cheek Crayon in Call Me Red, Darling! Is made for short days and long nights! Put on this bright red shade and turn up the heat. If this shade doesn't sway him away, we don't know what will! Nykaa Paintstix! Hearts n Kisses : Let the love reign, and let your lips give the sweetest kisses with Nykaa Paintstix! in Hearts n Kisses. This red with pink undertones is the prettiest red that you ll ever wear. Go ahead, pucker and pout! Nykaa Paintstix! 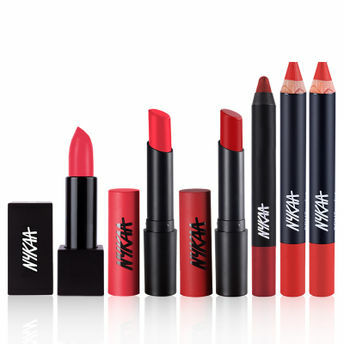 Rebellious Red : Don t let anyone bring you down, be a rebel that nobody can ignore with Nykaa Paintstix! Lipstick in Rebellious Red. When you need a pick me up, this bright red hue is enough to make you feel invincible. Step out and take on the world, nothing is stopping you! These cute, lipstick are all you need to make your look little more fun, little more glamorous! This cruelty-free, and high-pigment formula gives you a soft, cushiony matte finish. The unique formulation ensures that your lips stay comfortable, colored up and matte-smooth all day long. Another bonus: These vivid, full-coverage hues are hand-selected and named by our In-house Nykaa Panel, just in time for the most-trendiest season. The best part, these fun hues won t break the bank! Go ahead, stock em all!